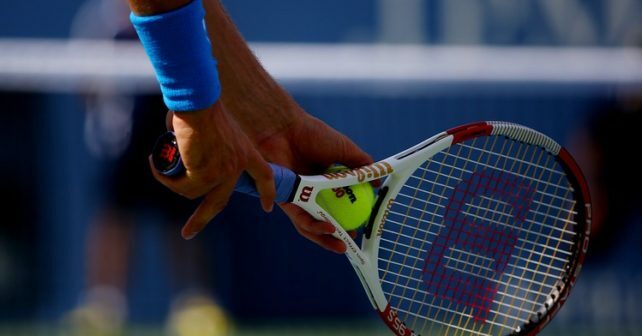 Do you wonder what racquets tennis professionals use? It is rarely the racquets they advertise but something called pro stock racquets with a paint job of the latest commercial racquet model. This post will help you get insight into what racquets the tennis pros really use. The tennis racquet industry needs to sell racquets to survive and the best way to sell a racquet is for a popular and successful player to endorse and market it. But since most tennis pros are meticulous about their gear, and the tennis racquet is so important, they would not want to change racquets willy nilly. Instead they use the racquet model they are used to. It is then usually customized to their specs and the company paints it as a new model and the player “endorses” this line of racquets. The racquet they really use under the so called paint job is usually referred to as a pro stock tennis racquet. Sometimes it is pretty close to what they are actually using. For example, Rafael Nadal plays the first edition of the Babolat Aero Pro Drive, but has always been endorsing the latest Aero Pro or Pure Aero line of tennis racquets from Babolat – right now being the Babolat Pure Aero . They are quite similar however, so it does not feel like a complete deception. It is similar with Nick Kyrgios who is using the Yonex Xi 98, but is endorsing the latest model Yonex Ezone 98. Then we have a guy like Andy Murray who is playing with a very flexible 20-year-old tennis racquet (with a string pattern that was never available to the public – the 16×19 version of the HEAD Pro Tour 630 is called PT57A in pro stock lingo). It has a true racquet face of 95 sq inches while he has been endorsing the Head Radical line of tennis racquets in its countless different iterations. Same goes for Novak Djokovic who has been endorsing a 100 sq inch racquet with the HEAD Speed line, but is using a 95 sq inch model based on an old racquet with the HEAD pro stock code PT113B. You can not buy Novak Djokovic’s real racquet in stores, but that does not mean the racquet he endorses, the Head Graphene XT Touch Speed Pro, is a bad racquet. Tennis Racquets of the ATP Professionals – Do we all need a pro stock racquet? So this is just the name of the game. Most recreational players will do fine with a good retail tennis racquet and need not worry about buying a pro stock racquet unless they really, really want to. And if you are not happy with your current racquet setup or have not found one with the specs you like, remember that you can always customise the racquet to your liking. Do you know which raquets are most popular in stock form for the newcomers and those ranked below, for example, 300. In other Worlds, what is the most common raquets for those not having paintjob och specially modifications. Can you tell me what would be the best Head racquet to use that is pro stock, as I’ve learned that every year its ridiculous to see how quickly new racquets come out every season. I had a feeling there was marketing gimmick used to sell. Repainting racquets and putting out detailed info. as if they actually have drastically changed was a question that I had for a long time. Of the latest Head speed and instinct racquets which model would your recommend was the best? Can you please clarify is it true that Gorman Ivanicevich and Marat Safin were using original version of Head Prestige Classic with some additional (to the basic 340 gr) weight? On the videos and pictures it seams that they used the old frame which was later painted like Prestige Intelligence? Yes, they both used the Prestige Classic 600 for most of their careers. Then they just painted them over. One way to tell is that the classic brown collar of the Prestige Classic is still there. Can you confirm that Dustin Brown is using the head graphene 360 speed pro ? I’m seeing that he’s using the racquet in his current challenger tournaments. Good question! He might be, but I am not sure. Will try to find out. The Extreme would be a more natural switch for him, but I think he wanted some good control as well as he used to string his Babolat at around 30 kg!